"I'm a blogger. Hear me roar!" 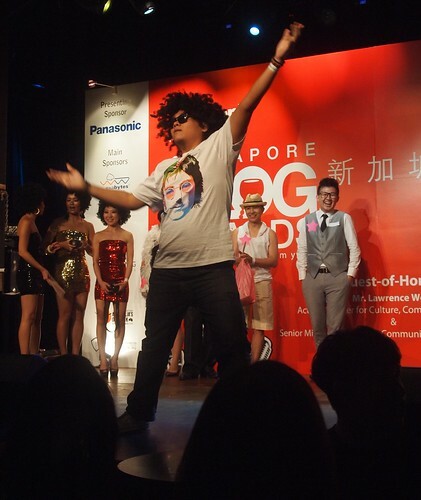 Judging by the response of the crowd at the Singapore Blog Awards 2013 held at Shanghai Dolly, it was clear that blogging was anything but dying/dead! 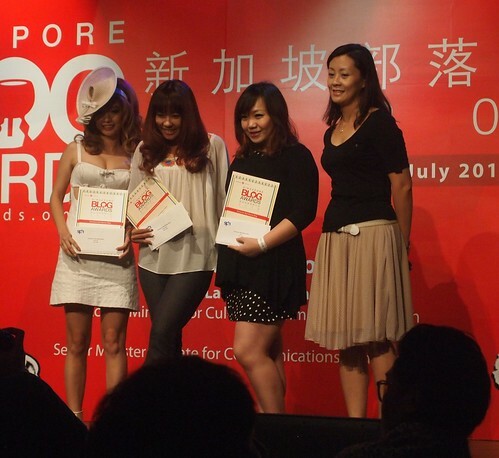 Celebrating its 6th birthday, the awards organised by Singapore Press Holding's Omy.sg honoured 19 social media content producers who invest blood, sweat and tears to entertain, educate and enrich our lives through their blogs, video channels and micro-blogs. 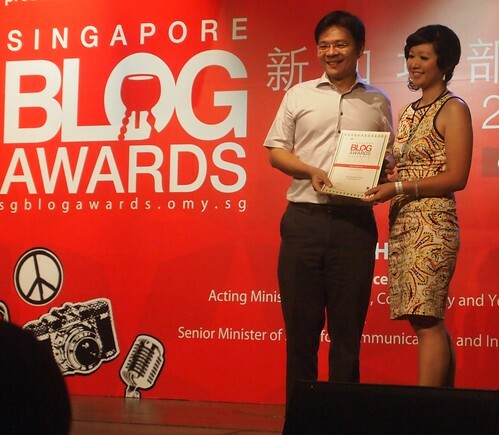 As a long-time supporter - been a judge since 2010 and helped host the first edition of the awards in 2008 at Asian Civilisations Museum - I'm delighted to see how the awards has helped shape the blogging scene in Singapore. 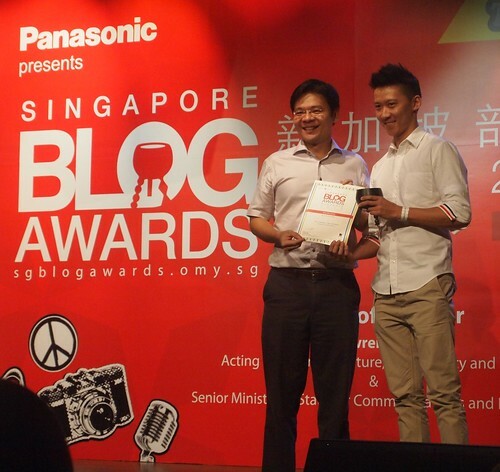 Over the years, many of the blog award winners have gone on to bigger things. Some have become mini celebrities in their own niche areas. Others have leveraged on the exposure and fame gained through blogging to launch new careers in fields as diverse as consultancy, PR, singing, and acting. 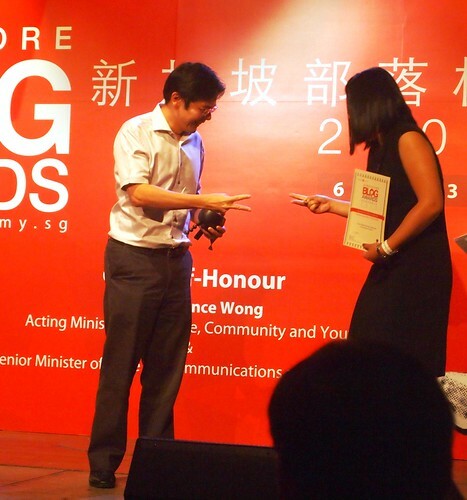 Join me now in reliving the excitement and glamour of the awards, as seen through my lenses. 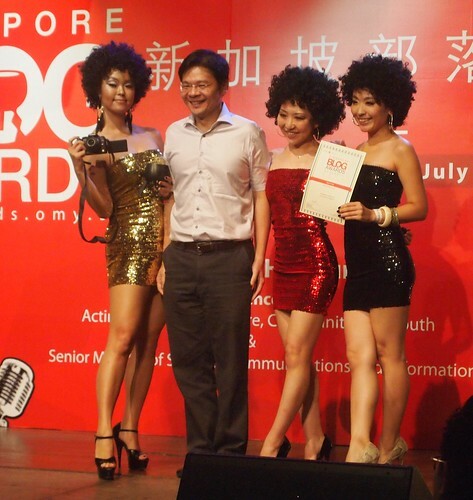 Camwhoring has always been a popular sport amongst bloggers. 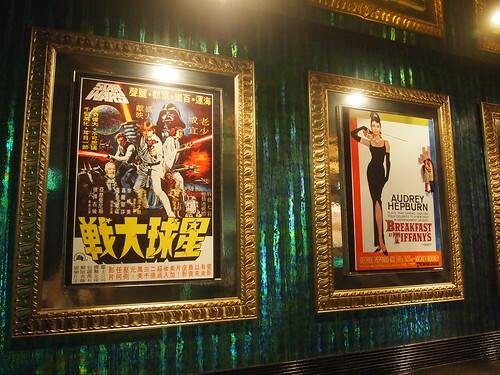 I didn't know that they had a Chinese version of Star Wars back in the past! What would Luke Skywalker say to Darth Vader when he sliced off his hand? 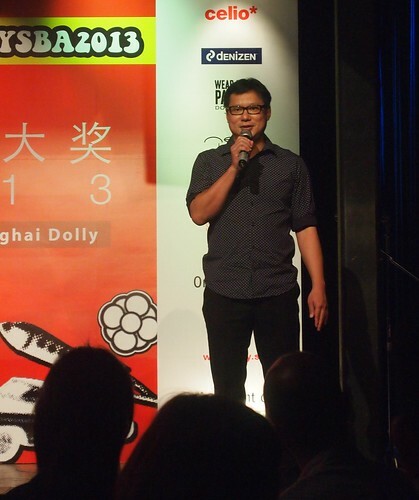 Mr Chua Chim Kang, Editor of Wanbao and Omy.sg, kicking off the award ceremony. 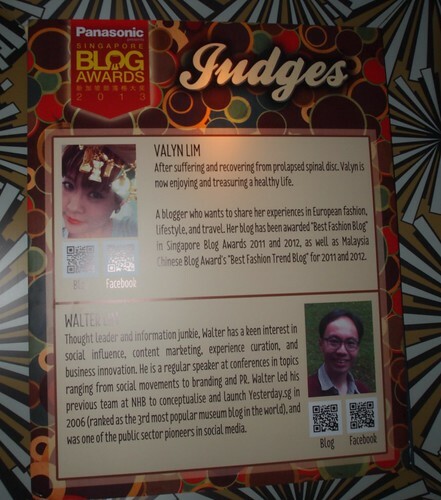 Nominees for the various categories had their "vital stats" flashed on the screen like so. 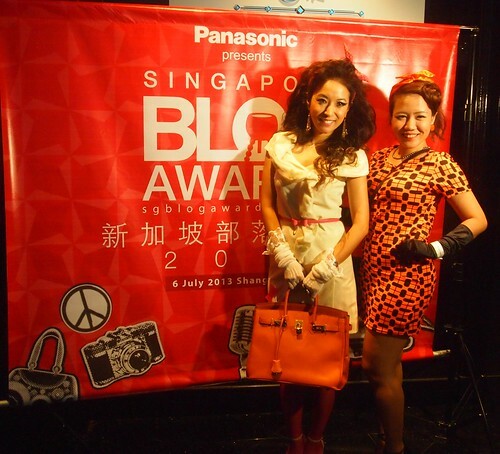 These 3 lovely ladies, Karen aka Renzze, Elaine and Elrica, are Best Beauty Blog winners sponsored by Panasonic. Food conoisseur and upcoming home chef Celes of Celestial Delish, winner of the Panasonic Best Cooking Blog, receiving her award. 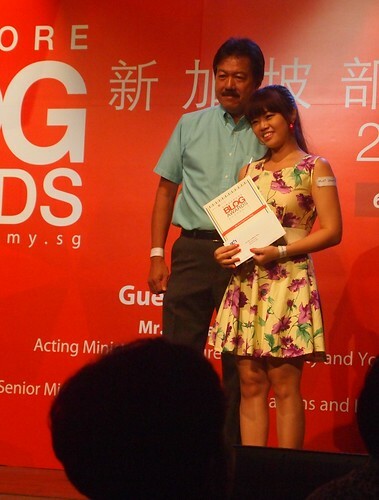 Talented Germaine (Mint) Leong hit the right notes by clinching the JBL Best Pop/Music Blog award. 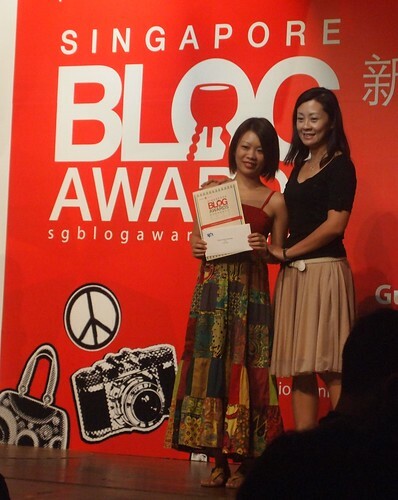 Stylish and sassy Claire of Claire's Flair clinched the Levi's Best 501 Interpretation Blog. No prizes for guessing who she is! 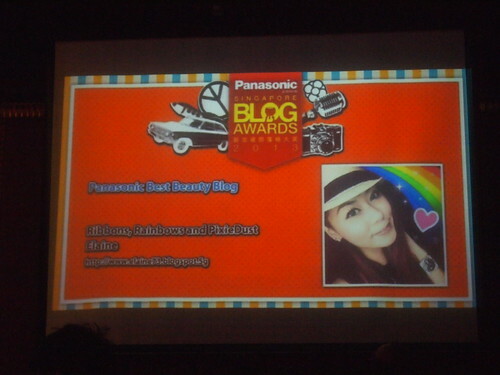 Apparently repeat winner Jeanette Aw (Panasonic Most Popular Local Celebrity Blog/Microblog) writes her own updates. Cool! 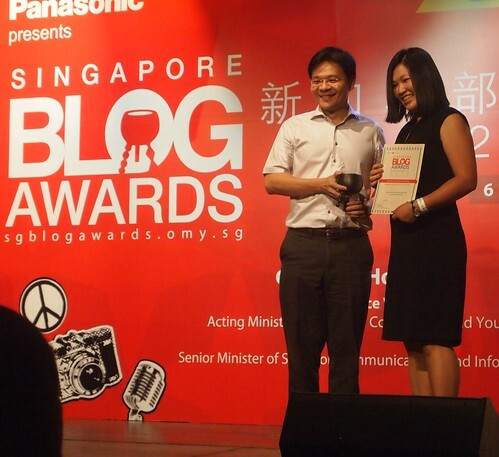 Up next was Ai Sakura, winner of the Best Family Blog category. While the competition was keen, her dedication to producing useful parenting and lifestyle content certainly made a difference. Catching more than their fair share of wolf whistles and cat calls were the ultra-glam Ninja Girls. 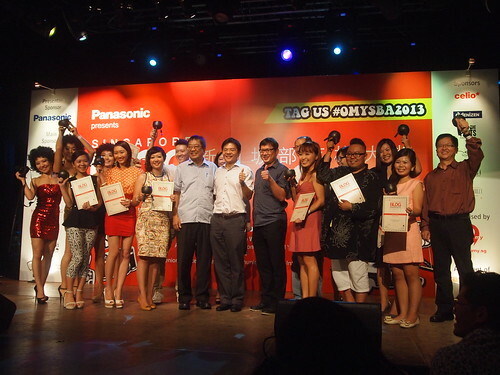 They "sliced" their competition by winning the Best V-log award. 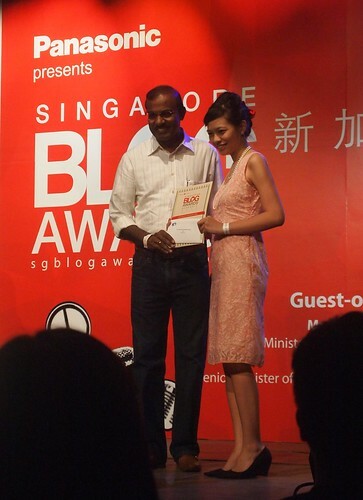 Finally, the winner of the Best Microblog who helms the Spin or Bin Music Twitter account and blog. 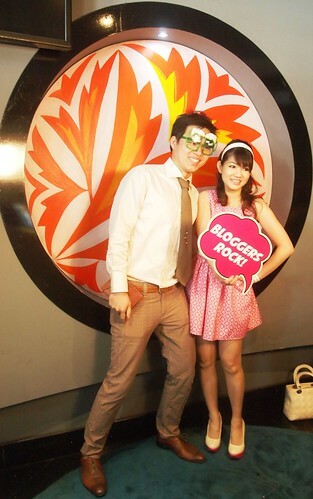 Its always great to see bloggers of new niche categories emerging. 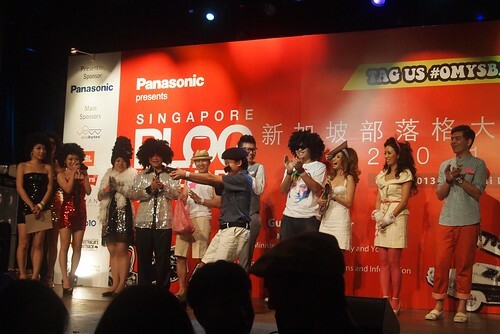 After all the applause and cheering, the audience waited eagerly for the fancy dress competition. This segment always added much fun to the awards. 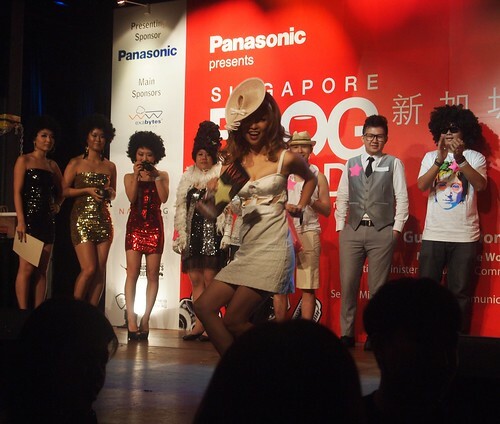 Contestants for the best dressed award watch as the eventual winner Adora of Gingerbread Mum hammed it up as "Inspector Singh". ...and the show stealing Ninja Girls who displayed none of that Japanese coquettishness nor shyness. These ladies certainly brought the house down. Before I go, do join me in raising a toast to all the bloggers, YouTubers, and microbloggers who participated in the blog awards. You're all winners in your own right! Cheers to more good years ahead!